Remember when you were a kid, and St. Patrick's Day was nearing, and you were obsessed with making sure you (and everyone else in your family) had something... ANYTHING... green to wear? 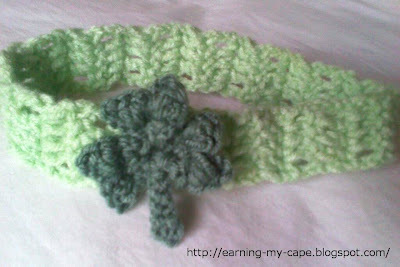 I thought it would be fun to make little clover headbands for my youngest girls. I was going to do it the easy way, and look up a pattern online. Unfortunately, all forms of internet access in my house was occupied at the time. I ended up having to wing it. The headband part would be easy enough. But the clover... I wanted something easy. Something that could be made all in one piece. I also thought it would be a good idea to write it down as I worked on it. After a little time, and a bunch of crossed out ideas on my papers, I came up with this quick and simple headband. 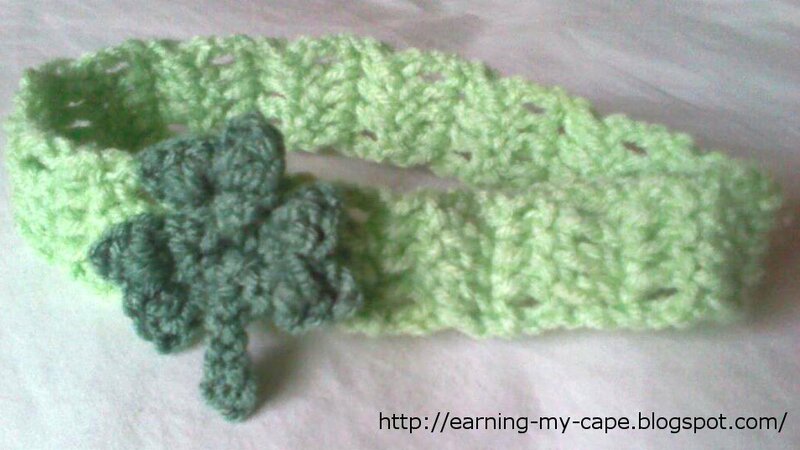 Click below for the pattern! Super cute! I wish my daughter would wear headbands. :-/ Maybe if I bribe her? My daughter's name is Clover! I have to make this for her!